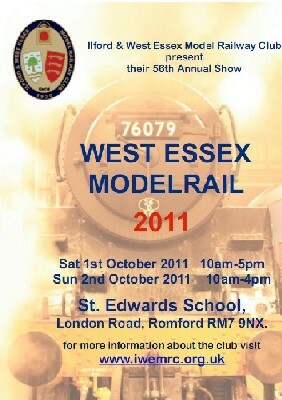 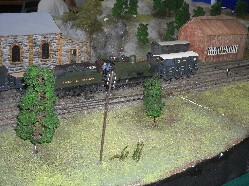 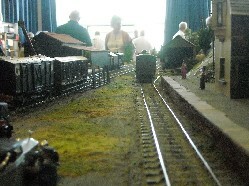 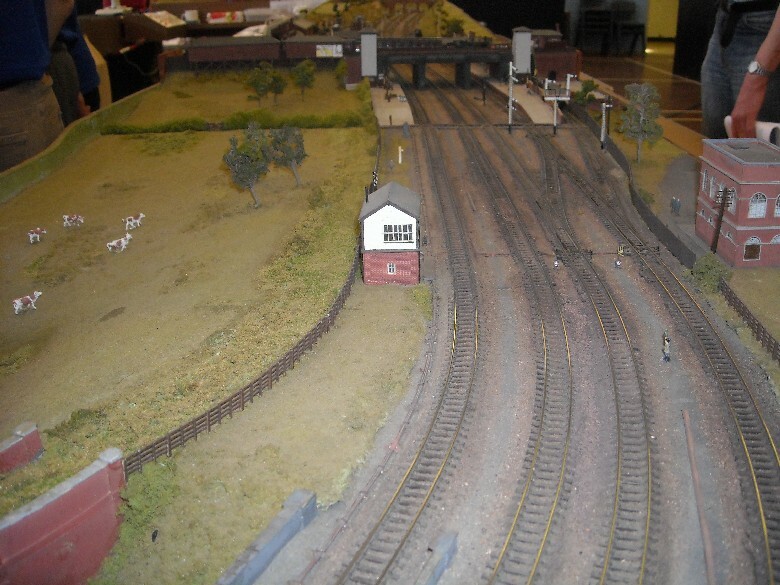 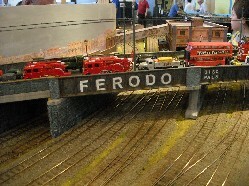 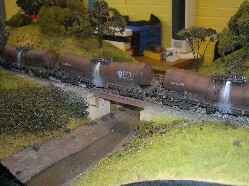 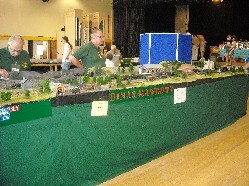 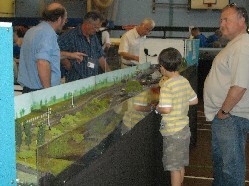 On Saturday 01 October and Sunday 02 October we held our 56th Annual Model Railway Exhibition. 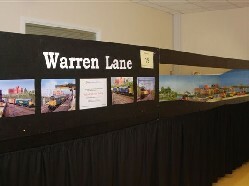 Photographs by Terry Allen, Alan Waredraper, Ian Waredraper, Steve Waredraper. 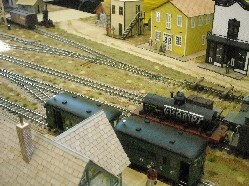 Binegar, OO Gauge, British S&DR. 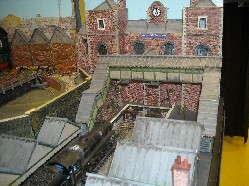 Based on the original station of the same name on the Somerset & Dorset Railway. 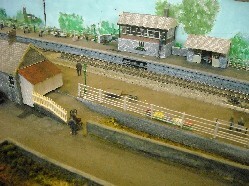 The original station was situated between Radstock & Shepton Mallet and was closed to traffic in March 1966, following the issue of the now famous 'Beeching Report'. 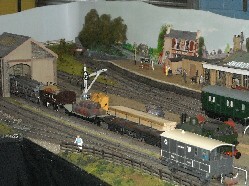 The layout is operated to a diagram based on the 1956 timetable (mid-week) and illustrates the variety of traffic on the S & D at that time. 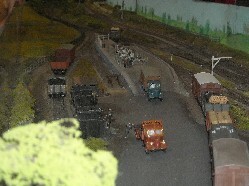 Bouviers Peak, On30, N American, D&RGW. 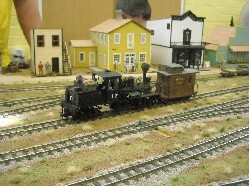 The San Juan extension of the Denver and Rio Grande West (D & RGW) Narrow Gauge reached Durango in 1881. 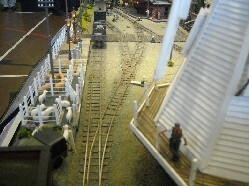 A line was built north from Durango to Silverton, which still exists today and forms the world-famous Durango & Silverton Railroad. 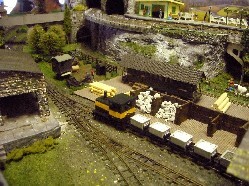 The Local logging company, the Rio Florida Logging Company or RFLC runs a large network of lines around Bouviers Peak. 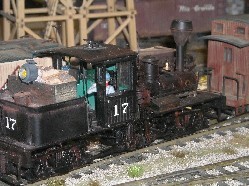 Bouviers Peak is the motive power base for the Rio Florida logging Company and its sometimes strange buying practices can be seen here - they would often buy one off, second-hand locomotives and use them till they were no longer repairable, but this practice didn't always work and the shareholders made the company buy some sensible motive power - the Shays and the Climax's were the resultant purchases. 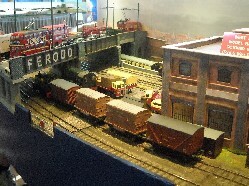 The small depot serves the local town with all of its needs, and the line also provides passenger services to the logging camps and to the rest of Colorado. 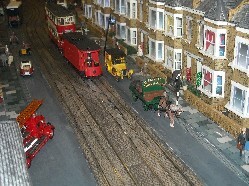 Cheerio Charlton, 7mm scale, London Trams. 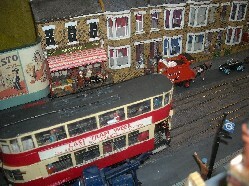 Representing a very short but fairly typical length of London's '1st generation' tramways. 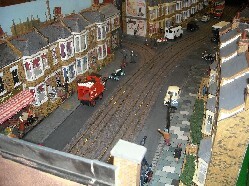 It is a representation of a few yards of Woolwich Road, Charlton, as it was until the trams ceased to run on the 5th July 1952. 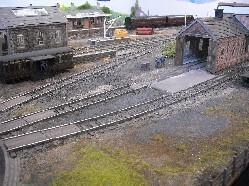 This was the location of the tramways Central Repair Depot, accessed by a siding off the double track "main line" which carried three of the last tram routes to operate, Nos. 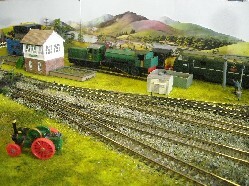 36, 38 & 40. 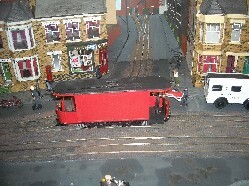 The trams collected current from the underground 'conduit' system, so there are no overhead wires, and the model trams represent the various types that operated on these routes (although they all bear a strong family resemblance!) 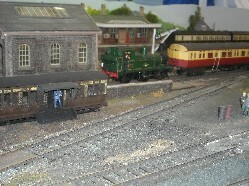 There are also a few 'works' cars and one or two oddities. 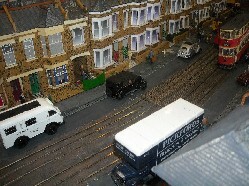 Woolwich Road and the buildings modelled still exist - only the trams have gone! 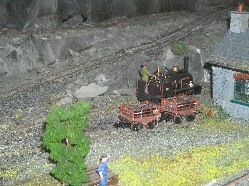 Dinas Mawddwy, O Gauge, Welsh Branch. 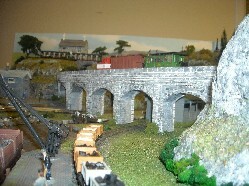 Dinas Mawddwy was an important market town at one time, with claims to a 14th-century charter, but it is now no more - and no less - than a highly picturesque village, just off the A470 between Mallwyd and Dolgellau. 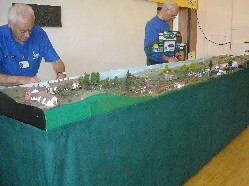 The old-world atmosphere owes much to the fact that the main road bypasses the village, which is encircled by steep-sided wooded mountains. 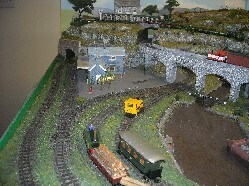 The lofty Bwlch y Groes Mountain road at 1791ft, is the highest road in Wales, clawing its way over remote uplands north-east of Dinas Mawddwy towards Llanuwchllyn and Bala. 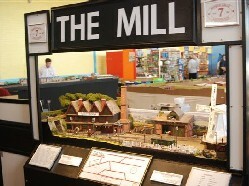 Meirion Mill Weaving unit and mill shop with tweeds, tapestries, rugs, coats and other products is housed in what was once part of the terminus for the now defunct Mawddwy Railway. 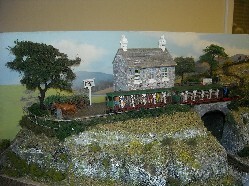 Pont Minllyn, just inside entrance to the mill complex, is a grass-topped packhorse bridge built in the 17th century by local rector. 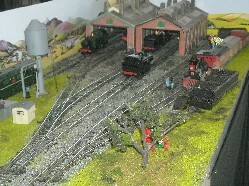 The Mawddwy railway (standard gauge) ran between Cemmes Road and Mawddwy, constructed in 1866/67 by Edmund Buckley, who later became Sir Edmund Buckley. 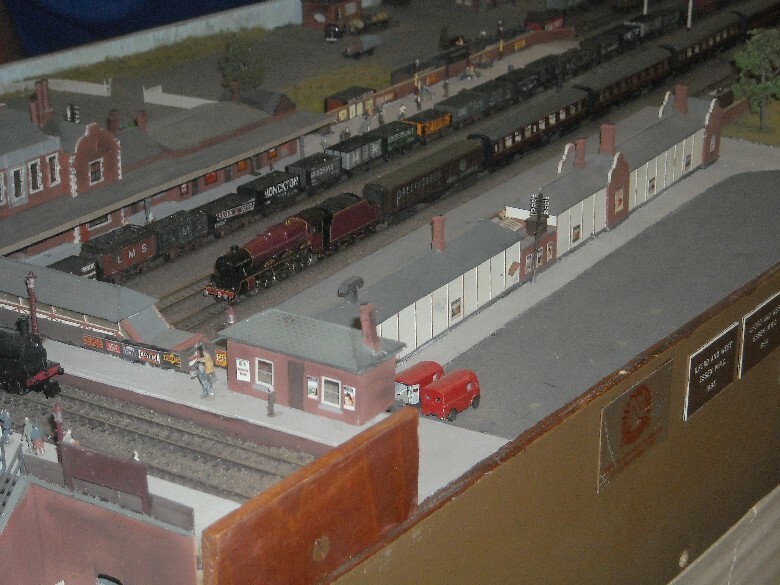 It fell into disuse in 1908, was re-opened in 1911 by the Cambrian Railway, and was absorbed into BR (Western Region) in 1948. 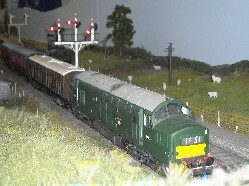 The last freight train ran on September 5th 1950 and the line closed in July 1951. 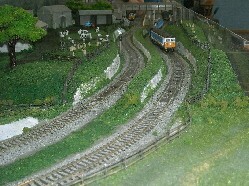 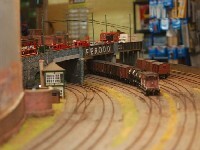 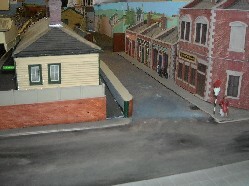 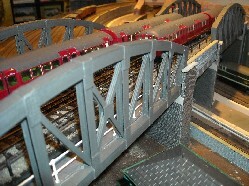 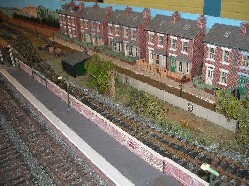 Farnborough Road, O Gauge, British, SE. 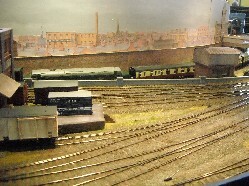 The story is that the South Eastern Railway, in the heady days of railway mania, decided to compete for the Bristol traffic. 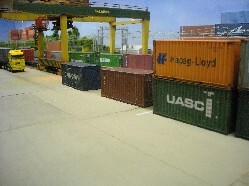 The requisite Act of Parliament was passed, work was started and then the LCDR acquired the continental mail contract. 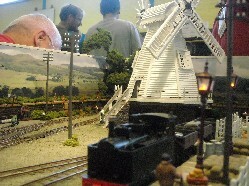 The SER put aside thoughts of expansion in favour of internecine warfare throughout the county of Kent. 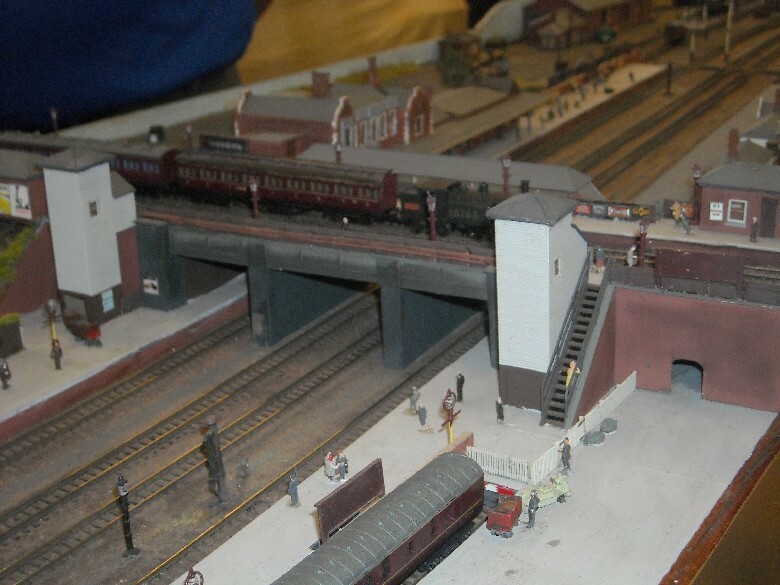 So the aspiration of the grand trunk line petered out in a muddy field in the outskirts of Farnborough, Hants.Time passed. 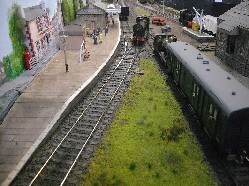 The SER became successively the SECR, the SR and now the Southern Region of British Railways. 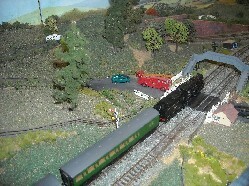 Steam retains a tenuous hold; with a Bulleid pacific hauling the main line train to London Bridge, and elderly pre-grouping 4-4-0s share the local traffic with standard classes. 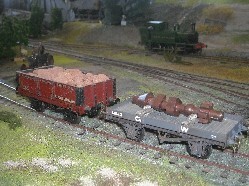 Much of the coaching stock is of similar antiquity. 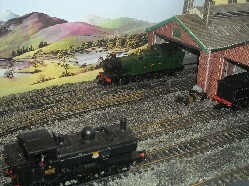 However, dieselisation is on the horizon, closely followed by the Beeching report and finally, closure. Fenchurch Cutting, OO Gauge, British. 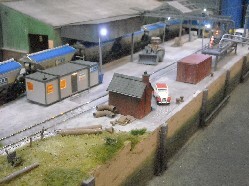 Fenchurch Cutting is a fictional layout loosely based in the East-End of London. 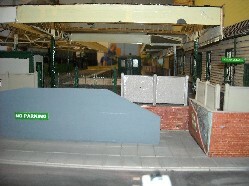 The model is trying to show an inner city environment where space is at a premium. 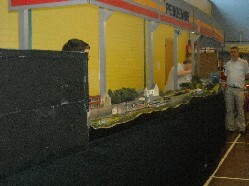 The layout has two levels: the lower part is built into a cutting and consists of a three-platform city terminus, loco spur/cripple road and a two bay parcels depot. 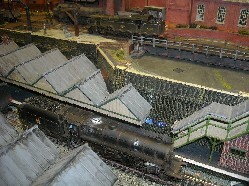 The top boards hold a small locomotive depot and the period is early 60s. 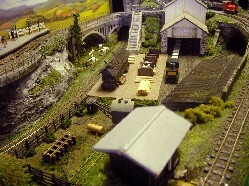 Hinton Parva, OO Gauge British. 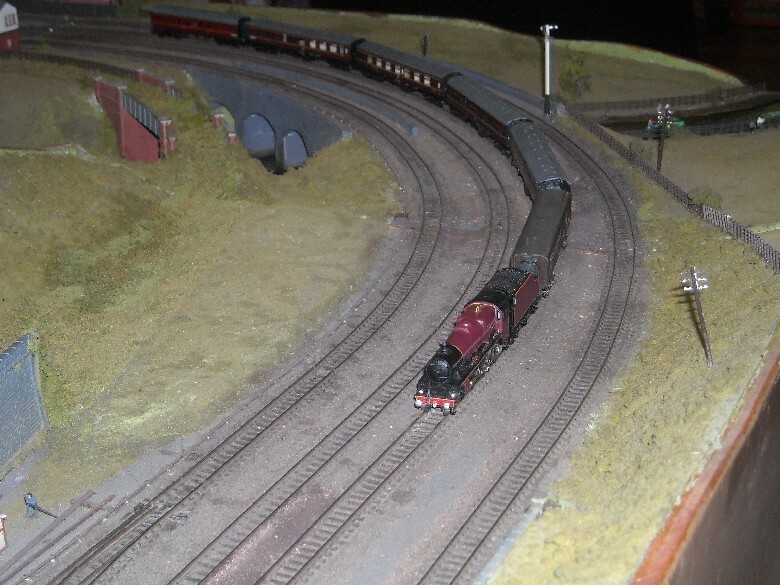 As OO gauge layouts go, they don't come much bigger than Hinton Parva. 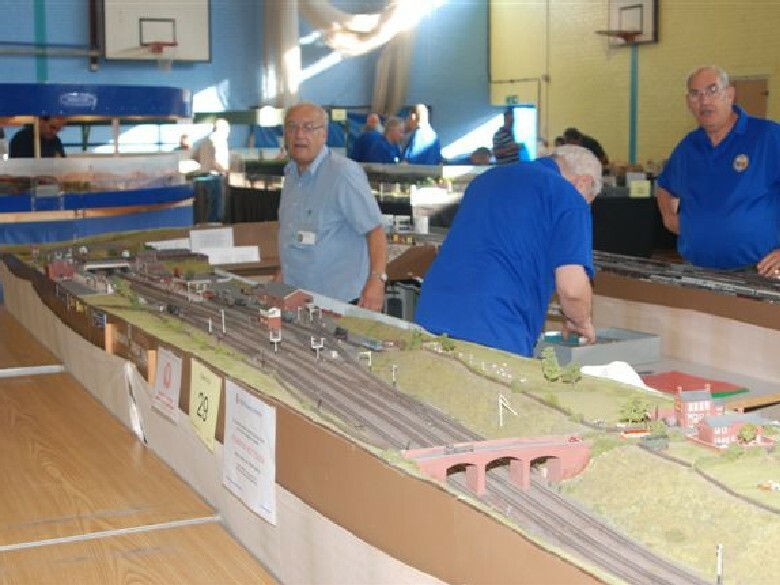 Devised many years ago by members such as Dave Potter, Harry Fielding, Graham Muspratt and many more, Hinton Parva has evolved into what it is today. 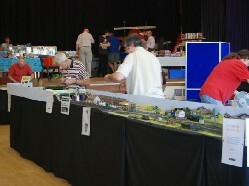 A complex amount of electronics and a maze of wiring ensure a compulsive display at any exhibition. 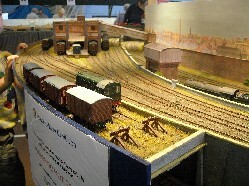 Featured in HORNBY magazine, March 2008. 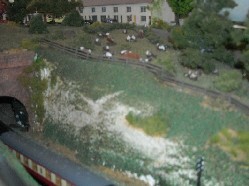 Meon Combe, N Gauge, British, BR(S). 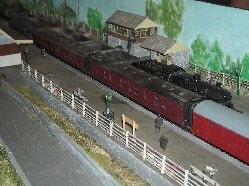 FACT: The MVR (Meon Valley Railway) was opened in 1903 by the LSWR and provided passenger and goods services linking Alton in the north to Fareham at the southern end of the line. 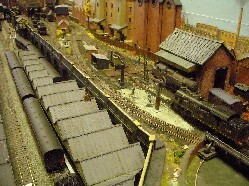 During the WW1, the line was used for troop movements to Portsmouth and Southampton, for embarkation to the continent. 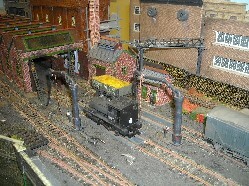 During WW2, the line was famed for hosting the train that housed the War Cabinet in June 1944.. 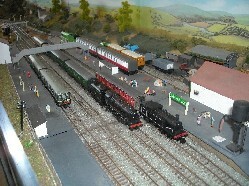 In 1955 the line closed for passenger services and goods services ended in 1968. 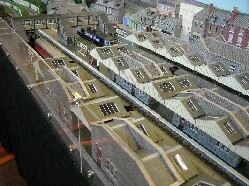 FICTION: Instead of failing and closing, it is assumed that the branch to Gosport prospered and the town grew along the lines of Worthing. 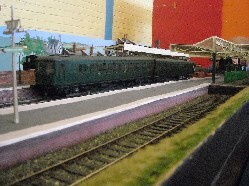 The resulting passenger revenue led to the Meon Valley line being electrified in the 1960's. 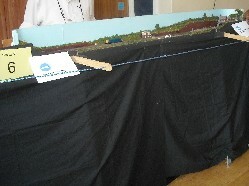 In addition, with the increasing demand for housing (mainly led by commuter employment), the Conservative Government of 1970 allowed limited development of some of the villages along the Meon Valley line. 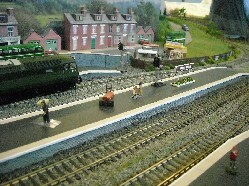 The station of Meon Combe benefited from the increased passenger traffic. 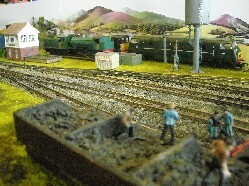 The layout is set in autumn 1971. 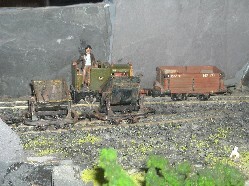 Mid Shires, 009 Narrow Gauge, British. 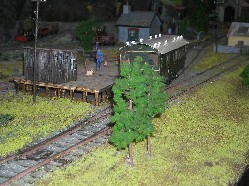 The Mid Shires Light Railway is a small rabbit-warren type 009 layout. 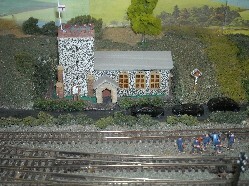 It was built by a Mr T. Jones to entertain his grandchildren and when he died, none of them were interested enough to take it over. 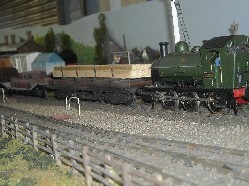 It stayed in his widow's conservatory for a number of years, and it was offered to the Colchester MRC just in time to save it from going to the local tip! 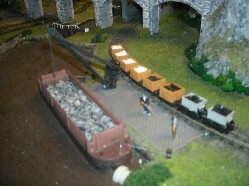 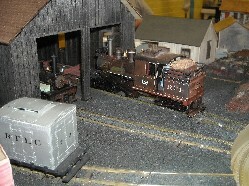 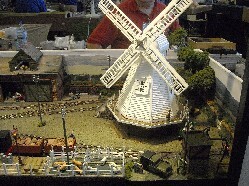 The Mill, 7mm Scale, 16.5 Gauge, British Narrow Gauge. 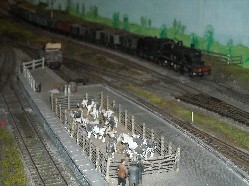 A fictitious scene set in the early 1950s in the Hampshire and Wiltshire area. 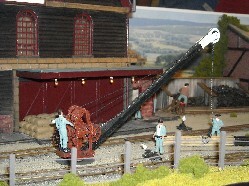 The narrow gauge line helps to bring corn from surrounding fields to the windmill, to grind into flour after which it is taken to the flour mill for bagging up in sacks ready for the railway to take it to the mainline down the line for distribution to various towns close by. 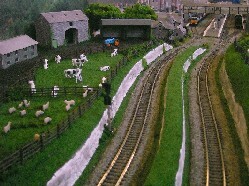 Also there is "Mill Holt" that deals with farm traffic i.e., sheep, pigs, and cows also going to market for sale, and the small community use the line to link up with the main railway network further down the line. 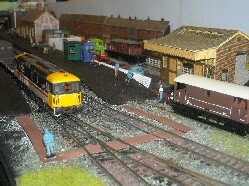 Norvic Junction, N Gauge, British, Southern/BR(S). 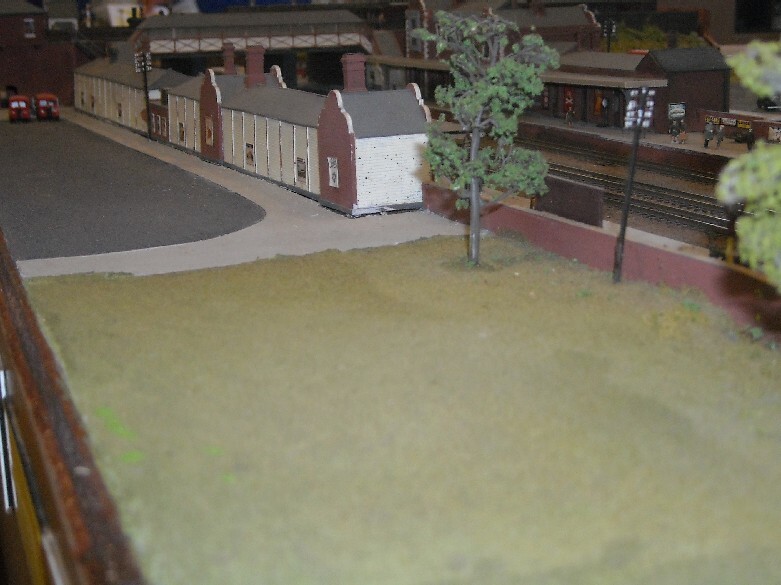 Norvic Junction was conceived even before the battle of Fearlessness and represents an area of the Southern Region providing for the village, local coal and a service for commuters into the city. 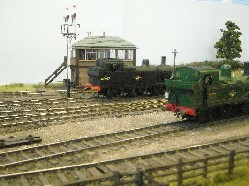 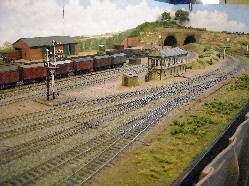 Norvic Junction is a club layout and was purchased from the N Gauge society (North West Kent Area Group) having previously been exhibited as 'St Mary's' in another era. 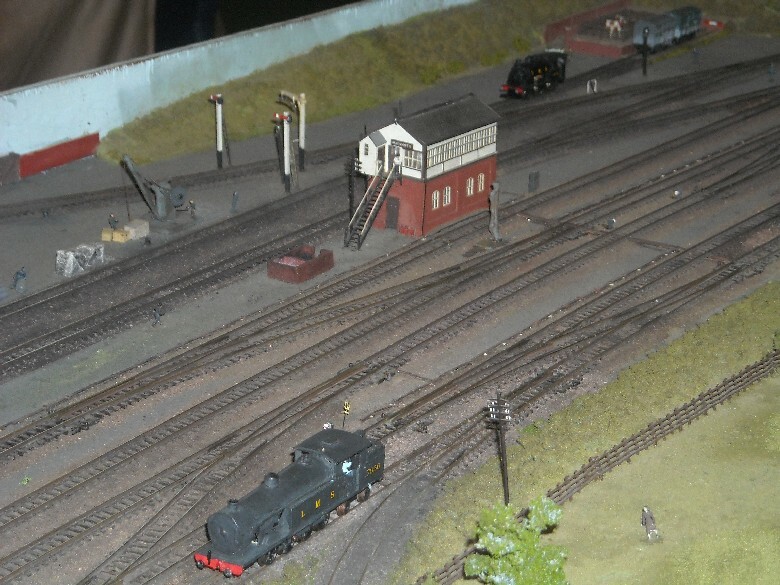 It is intended to be a family layout, so during exhibitions you will see steam, diesel and maybe even Thomas, James and Percy running, depending on which operators are at the exhibition in question! 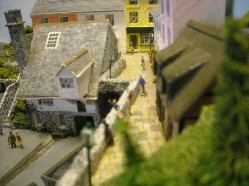 Pendennis represents a fictitious but typical small Cornish fishing town complete with a quay. 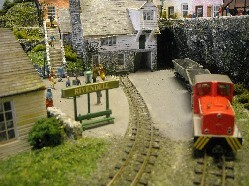 Originally only a small village, served by a modest narrow gauge railway, Pendennis gradually developed into a thriving town thanks to the China clay trade and now has regular freight and passenger services. 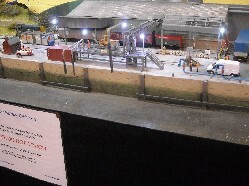 Due to diminishing fishing quotas Pendennis Quay has now been taken over by English China Clay Ltd and is operated by them to ship clay products to other UK and Scandinavian ports. 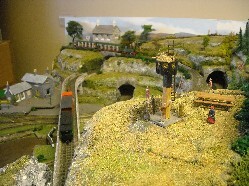 Stepney Down, OO Gauge, British. 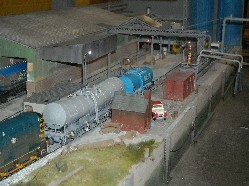 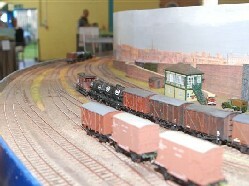 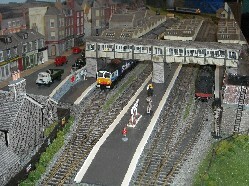 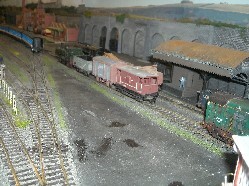 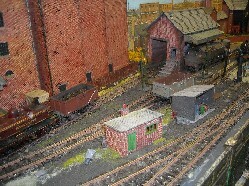 Stepney Down is a 00 gauge model railway based upon a fictional preservation railway terminus. 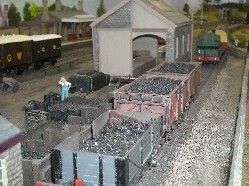 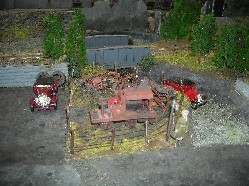 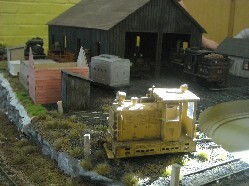 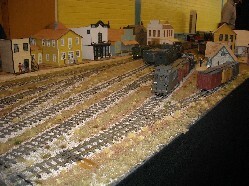 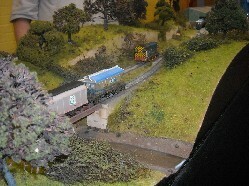 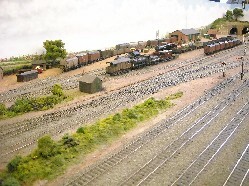 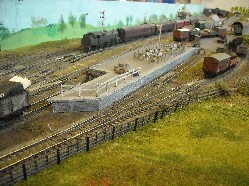 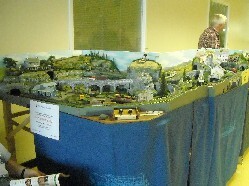 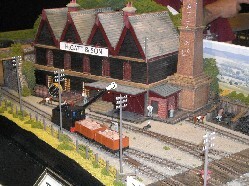 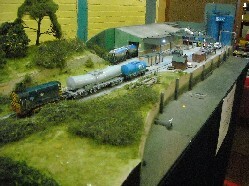 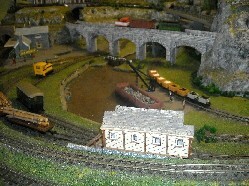 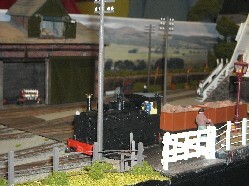 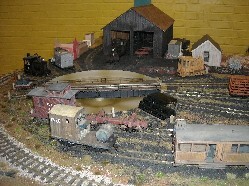 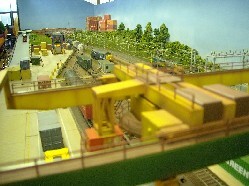 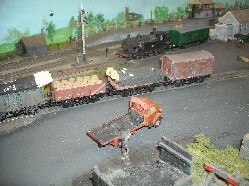 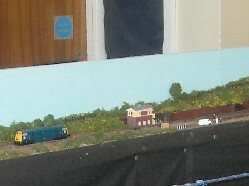 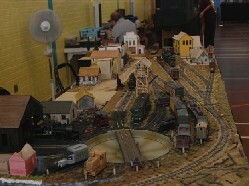 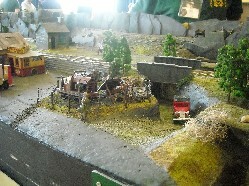 The layout was created in Autumn 2007 when the owner and creator was 14, and is his first attempt at making a model railway. 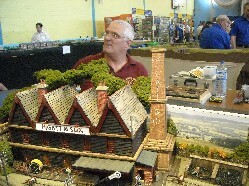 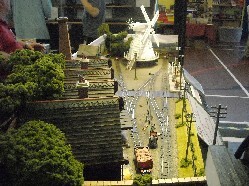 It was built at the Hornchurch And District Model Railway Club. 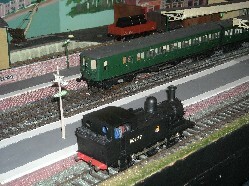 Tamworth, N Gauge, British, LNWR/LMS. 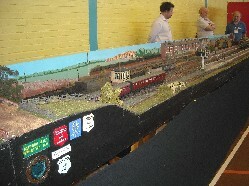 The layout represents the station at Tamworth on the Trent Valley Line on the LNWR/LMS West Coast main line, London (Euston) to Glasgow (Central). 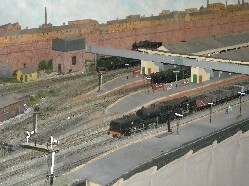 The Tamworth high level station was located on the Birmingham-Derby main line of the Midland Railway, opened in 1839. 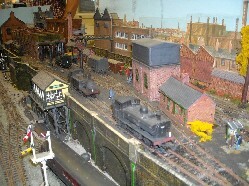 The Trent Valley Railway was built from Rugby to Stafford by the LNWR, and opened in 1847, so that the west coast main line could bypass Birmingham. 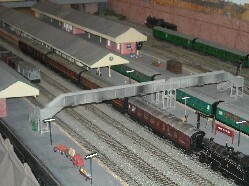 The LNWR line ran at right angles to - and passed beneath - the Midland station by means of a bridge. 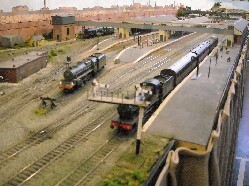 Tamworth was a small market town, but its location astride the West Coast and Midland lines linking Bristol to Newcastle gave it immense strategic importance as a postal exchange point, and secured for Tamworth a passenger service that was far better than might otherwise have been. 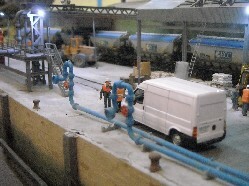 Featured 'Railway of the Month' Railway Modeller January 2005. 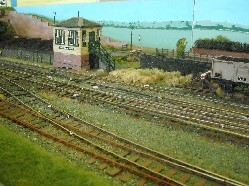 Taw Magna,O Gauge, British, GWR. 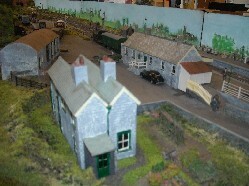 Somewhere in the West Country is the small town of Taw Magna. 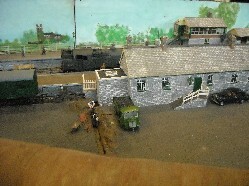 The period depicted today is round about 1950, just after nationalisation. 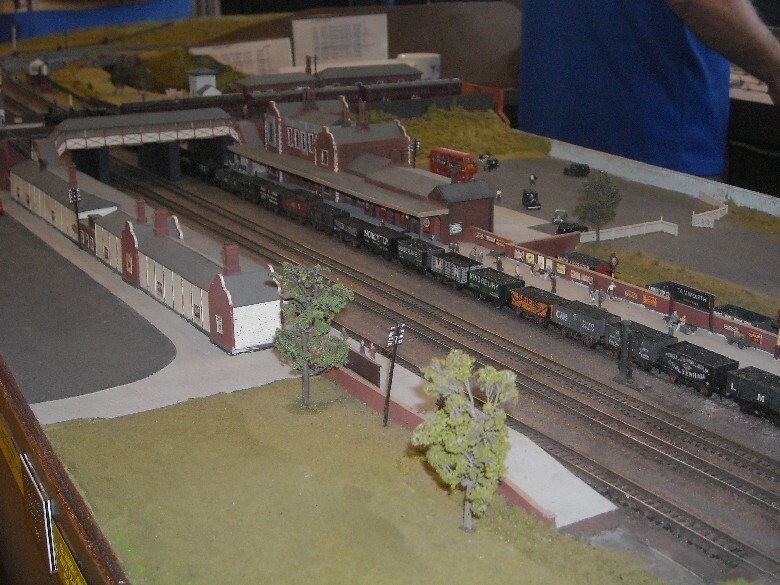 This gives us the opportunity to exhibit a large selection of locomotives, mostly GWR and a variety of rolling stock; some being very old and full of character, most of which have been built by the 0 section members from well known kits. 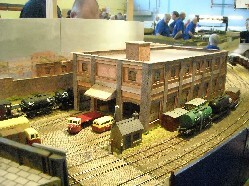 The prototypes for the main buildings, all scratch built, were acquired from around the area (you will recognise Abbotsbury Station). 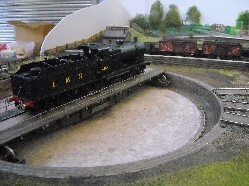 The large turntable has been included enabling far larger locomotives than would have been used in its GWR heyday to appear on the line from time to time. 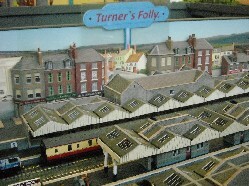 Turner's Folly, OO Gauge, DCC, British. 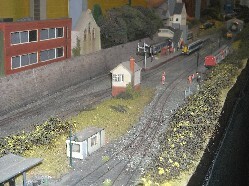 A OO Gauge exhibition layout running DCC (Digital Command Control). 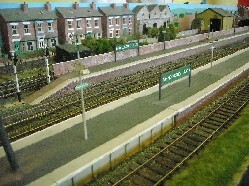 The layout has been designed as a two round continuous run layout which may be viewed from all sides. 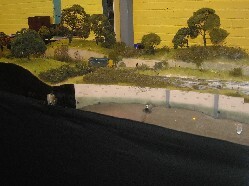 Scenic back-drops separate the operators from view and allow for running the timetables without being disturbed. 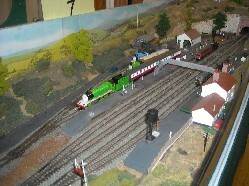 The layout's setting is nowhere in particular with no definitive period in mind, so we are able to run Steam, Diesel and EMU's. 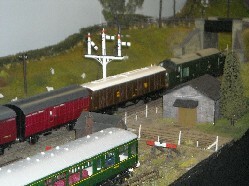 All engines have been sound equipped and one member has installed working lights to the engines and passenger coaching stock. 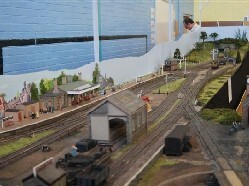 The idea of the DCC layout is to demonstrate multi-train control and to show visitors how much simpler the wiring is with DCC. 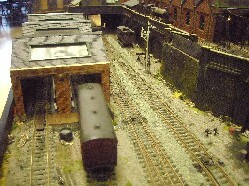 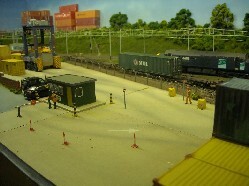 Warren Lane, OO Gauge, British, Freight Terminal. 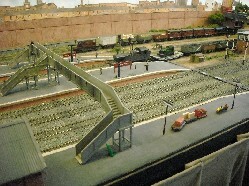 Warren Lane is an OO gauge freightliner terminal, set in East Anglia between 2005 and 2009. 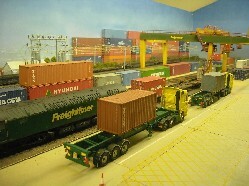 Intermodal trains arrive from all parts of the UK, two working gantry cranes quickly unload them, and the empty wagons are soon loaded with containers fresh off huge container ships from China, Korea and many other trading nations. 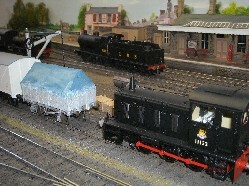 The train receives a fresh engine and is away to its next destination. 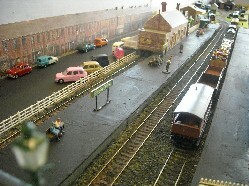 Warren Lane is a very busy place! 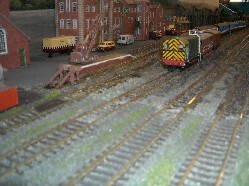 Wembley East, OO Gauge, British. 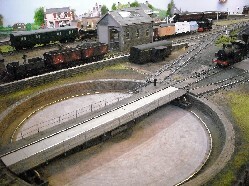 Wembley East is an unusual layout, being a 12ft diameter circle, based on a setting on the Great Central Line running northwest out of Marylebone Station. 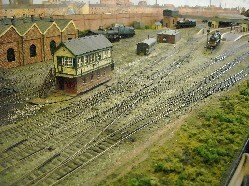 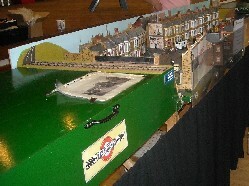 Although the scene looks authentic, with its sidings and rolling stock, it is entirely fictitious. 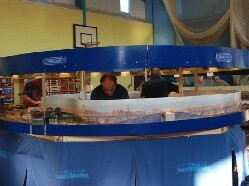 The layout can be viewed from anywhere around its circumference. 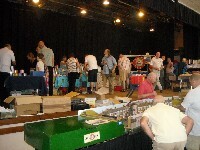 Information about the club, and second-hand bargains from club members' own stock. 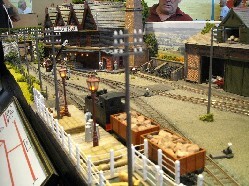 Indoor train rides on 5" Gauge electric trains.